Quick, check your wallet! 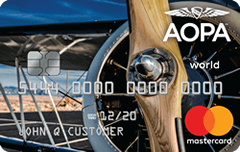 If you don't have the NEW AOPA Credit Card you're paying too much for your aviation purchases! Help support your association while earning 1% cash back on general purchases, 2% at FBOs, Aviation & Auto Fuel, Ridesharing, & Taxis, 3% at Aircraft Spruce, and 4% for select AOPA purchases.